Last year I had so much fun participating in the Garden Snail Quilt Snail Paced Sew-Along hosted by Gnome Angel! The sew-along used the Garden Snails Quilt pattern by Pen + Paper Patterns. I love Pen + Paper Patterns since they are extremely well written, and super fun. You can purchase her patterns at Craftsy. 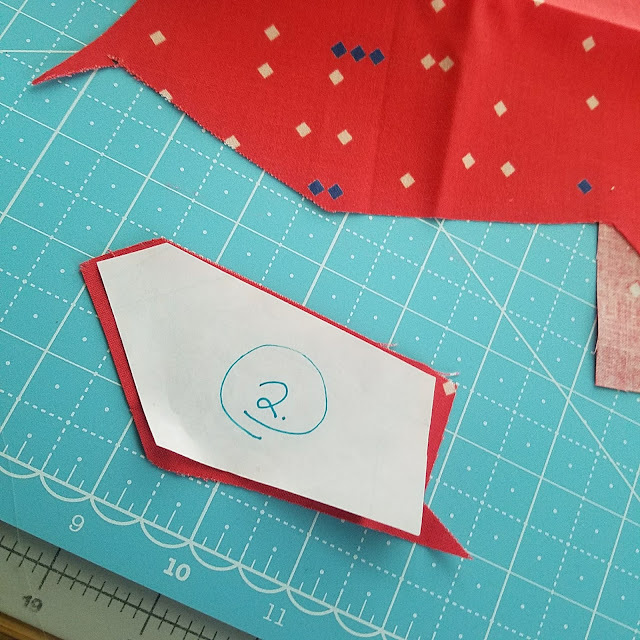 I love paper piecing, so I was excited there was an option to make the snails using this method. I decided to paper piece all 42 snails. This is a lot of paper piecing, so I tried to find ways to make the process a little less daunting. 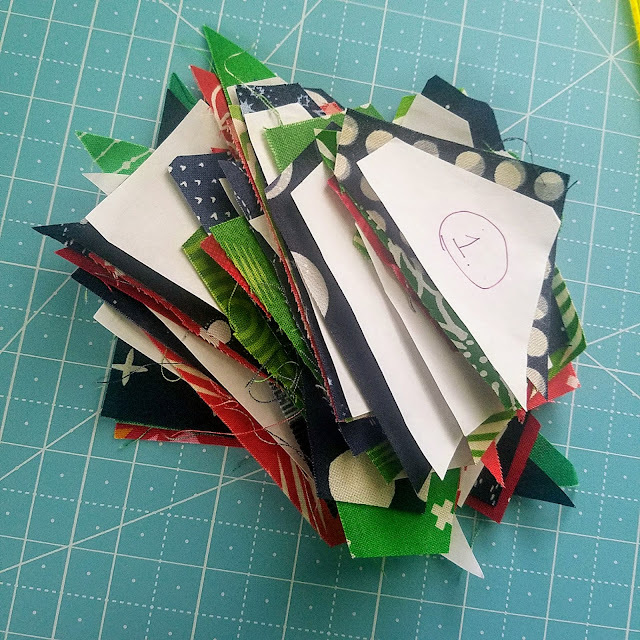 Here are a few of my favorite "tips and tricks" for paper piecing multiple blocks that make it a little easier and more efficient. When paper piecing multiple blocks there are a lot of steps! 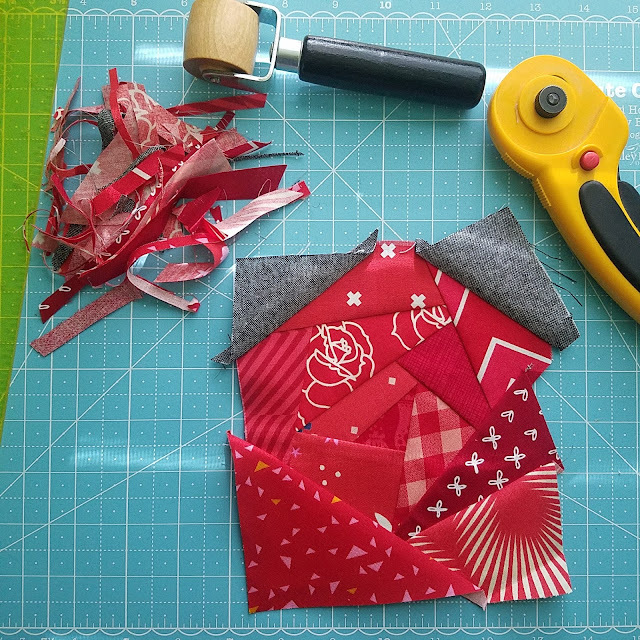 One of the steps that can take quite a bit of time is cutting and sewing the fabric to the foundation paper. I think this part is the most stressful for me because there is nothing worse than not having enough fabric and having to rip out all those tiny stitches! I also dislike wasting fabric by cutting the fabric pieces too big. So my solution to this is using templates to cut the fabric. This takes the guess work out of how much fabric is needed and reduces waste. And it definitely helps move things along more efficiently since I know I have the right amount of fabric in the right shape, especially when making many blocks. Here is the basics of what I do. 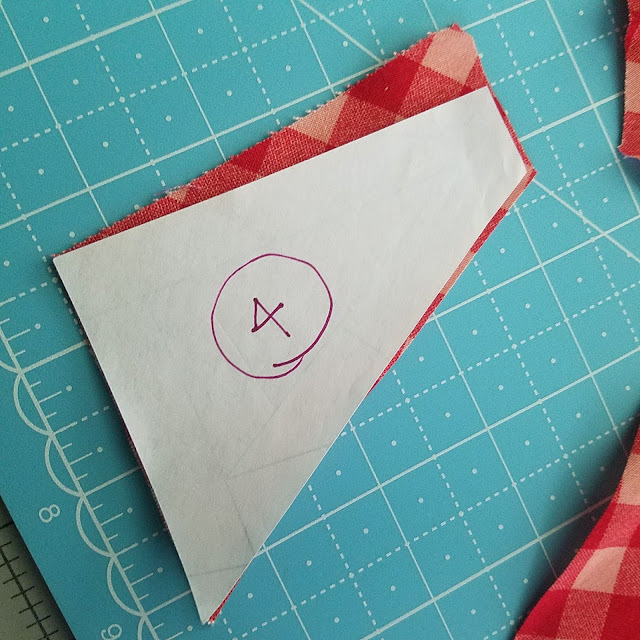 Step 1: Print multiple copies of the pattern and cut out each numbered section or "piece" that you will need fabric for. In this case each part of the snail's shell. 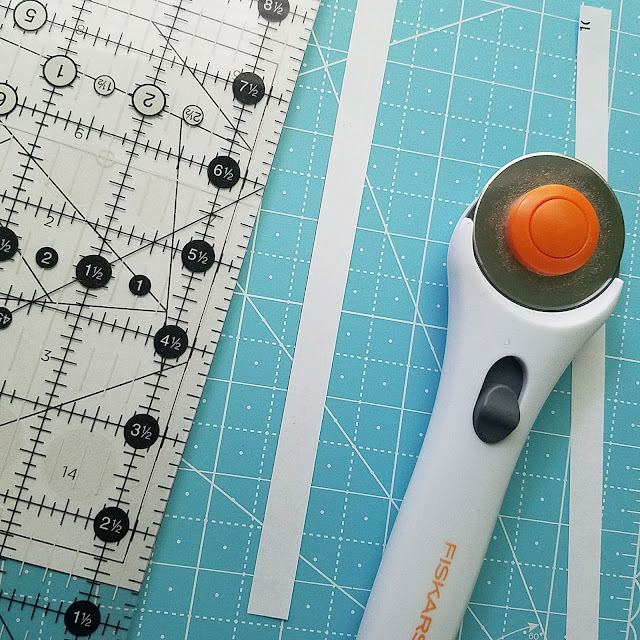 I use my ruler and a paper-only rotary cutter to cut each piece with an extra 1/2" from the sew line. 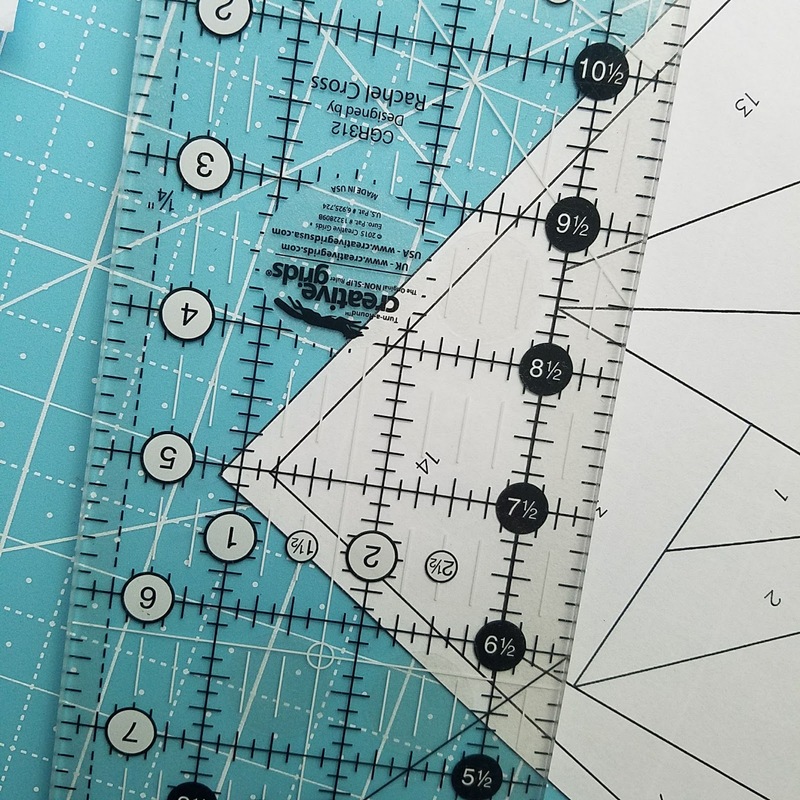 You will not be able to cut all the paper templates from one print out of the block due to the extra 1/2" but you can cut more than one to save some paper. And you can use other materials like cardboard or plastic to make your templates, but I find the paper is the least amount of work and gets the job done. Here is an example of one of the cut template pieces. Step 2: Number the back of all the paper template pieces: This might seem like a needless step, but this is why I do it. To make the fabric shape fit when making a block that isn't symmetrical, you need to cut the fabric with the back side of the template facing up and the right side of the fabric facing up. This helps me remember this key step. Step 3. 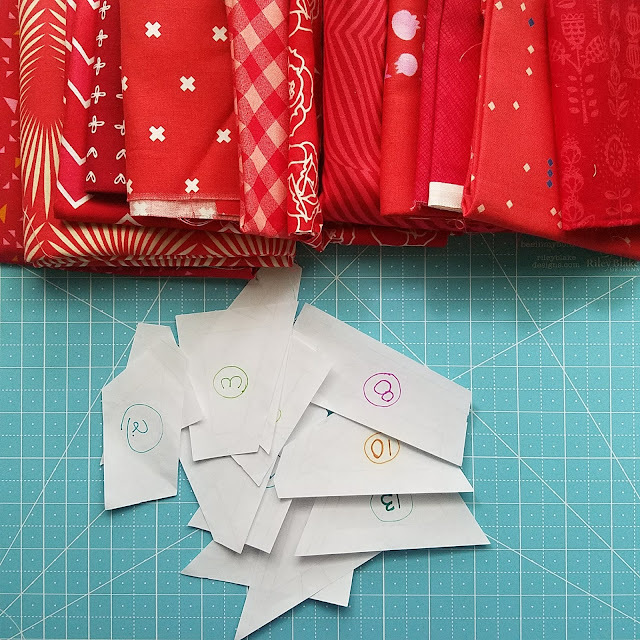 Gather up the fabric for one block: I gather all of my fabric in a pile to start cutting. 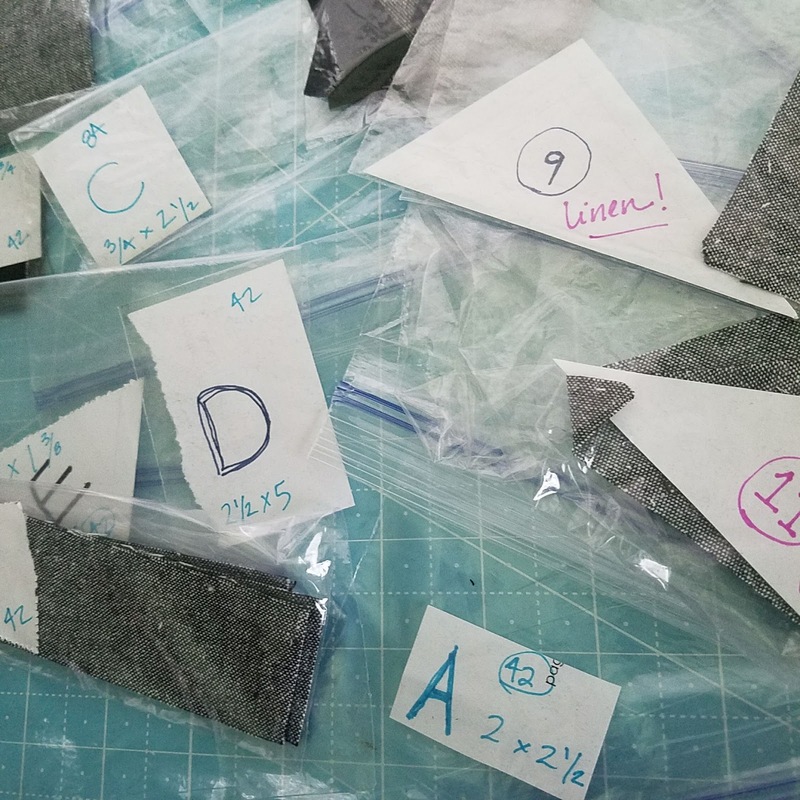 Depending on the color scheme you are using you will need to pay attention to the order of fabric in your pile and where it will be placed in the block. I adjust the order of the fabric as I cut to help get some contrast if needed in the block. 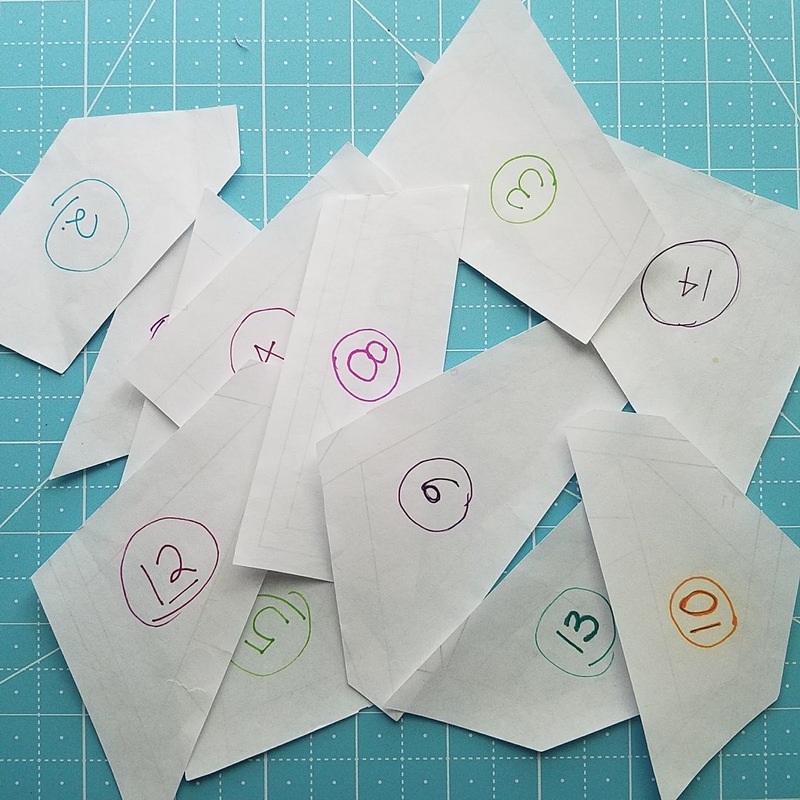 I then take each template and place it on the right side of the fabric with the backside of the paper facing up to make sure I get the correct shape. Unless your shapes are symmetrical, it won't cover your space correctly if you do not follow this step. Also, if you are using directional prints or want your piece to feature a certain part of the fabric, you will need to pay attention to the placement of your template to make sure you get the part of the fabric you want to see in the block. You don't need to be exact in your cutting at all. I just find this helps me conserve fabric and takes some of the guesswork out of it! I keep cutting until all of the papers are in a pile. If I want to sew multiple blocks at one time I keep adding to the pile, keeping each numbered piece together (i.e. the number 1 piece with the other number 1 pieces). And here is the finished product (well, almost finished)! This picture shows how much extra fabric I trimmed off using this method. There is definitely some extra, but not too much. And there is enough fabric to cover the space so I can keep the seam ripper away. If you need help with how to do the actual paper piecing the pattern designer (Paper + Pen Patterns) recommended the one found here. Of course some of this may not work for ALL foundation paper pieced patterns, like those with really small pieces, but it is great for patterns with bigger and non-symmetrical pieces. 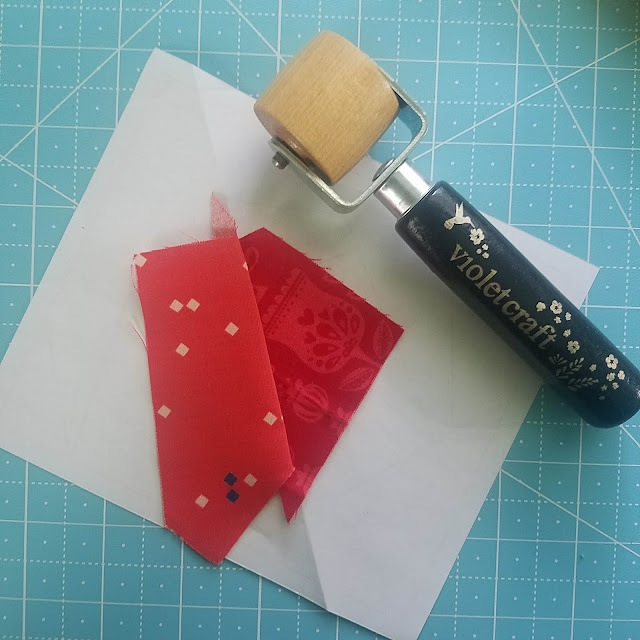 Here are just a few other tips that I use to be more efficient when paper piecing. 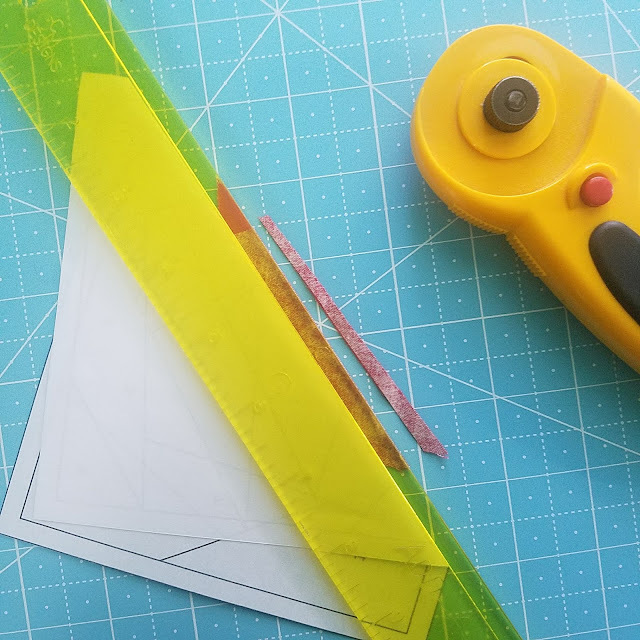 Use an old rotary blade to cut paper: I use an old rotary cutter blade to cut my paper. This makes cutting the paper so much easier! I have a rotary cutter that is exclusively used for paper cutting so it is always ready when I need it and I don't have to fuss with changing blades. I even use the rotary cutter for cutting wrapping paper when I'm wrapping gifts. 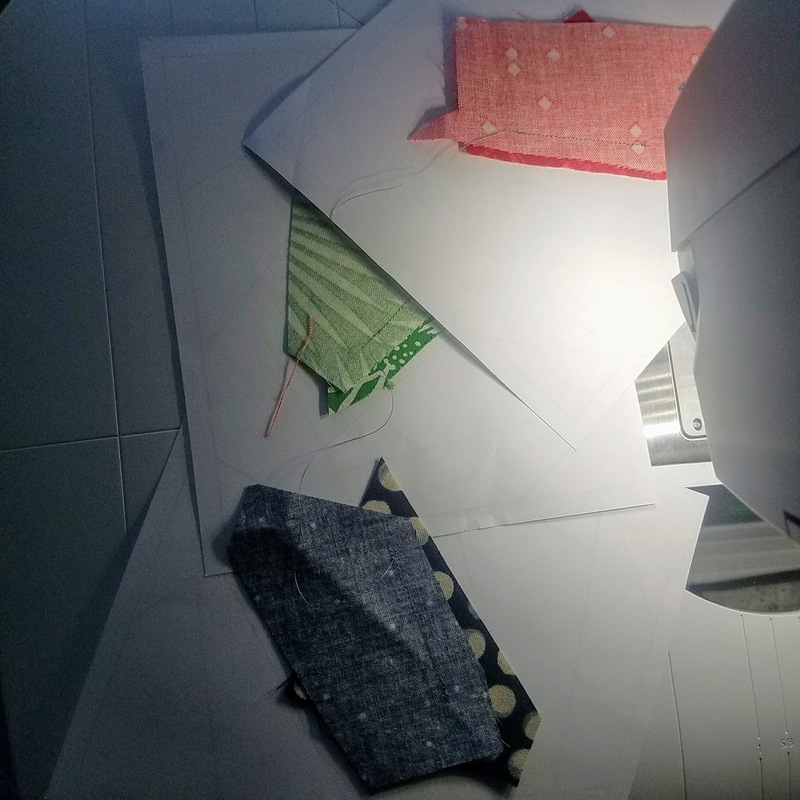 Cut and sew all of the parts of the block that are not paper pieced: I find it most efficient to cut the background fabrics and pre-sew all of the parts of the pattern that are not paper pieced. For this pattern I pre-cut all of the corner pieces for the snail shell, and pre-cut and sewed all of the pieces needed for the snail "body." I made labels for each piece with the size of the piece and the total number needed, and put them into baggies to help make assembly line sewing of the snail body and the finishing of each snail more efficient. 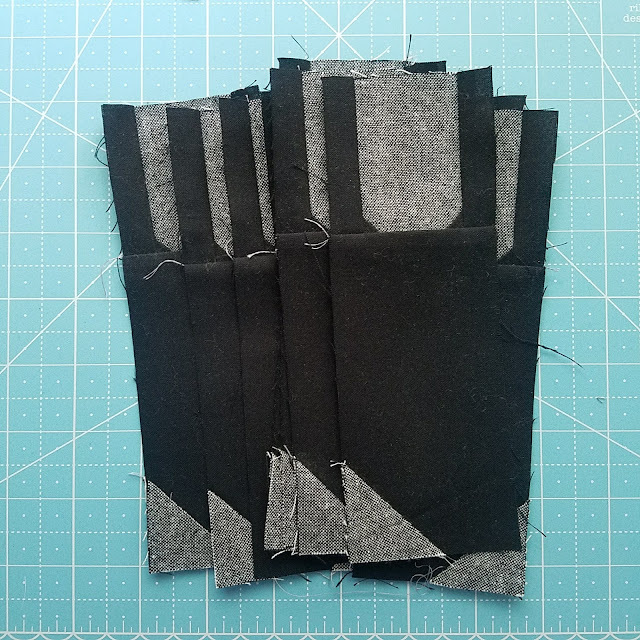 Doing a little "assembly line" sewing and finishing these ahead of time makes things go a little faster once the paper pieced shells are done. Use some helpful tools: I love my Add a Quarter Ruler and Violet Craft roller. These tools are so useful and definitely help make this method much easier. I don't know about you but I'm eagerly awaiting the July Pattern Drop release of the Firefly Quilt by Pen + Paper Patterns and associated Quilt Along. I think I might opt for making bees instead of fireflies, but either way it will be so fun to make! 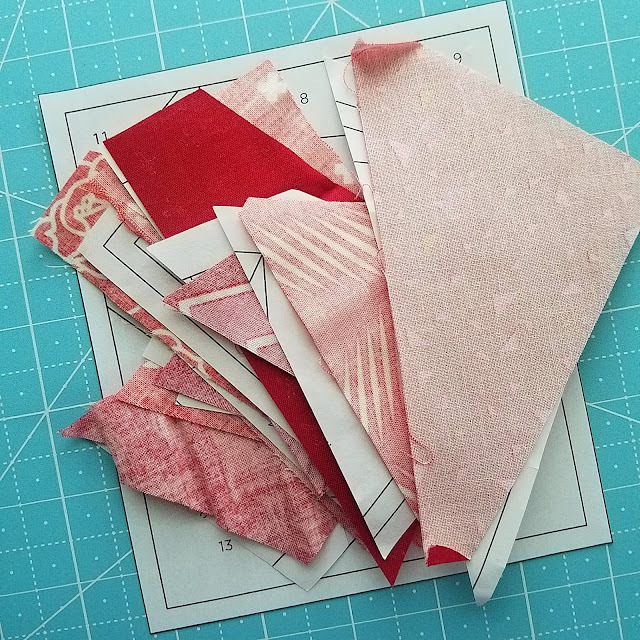 I hope you find something in this post that you can use next time you work on a foundation paper pieced project. 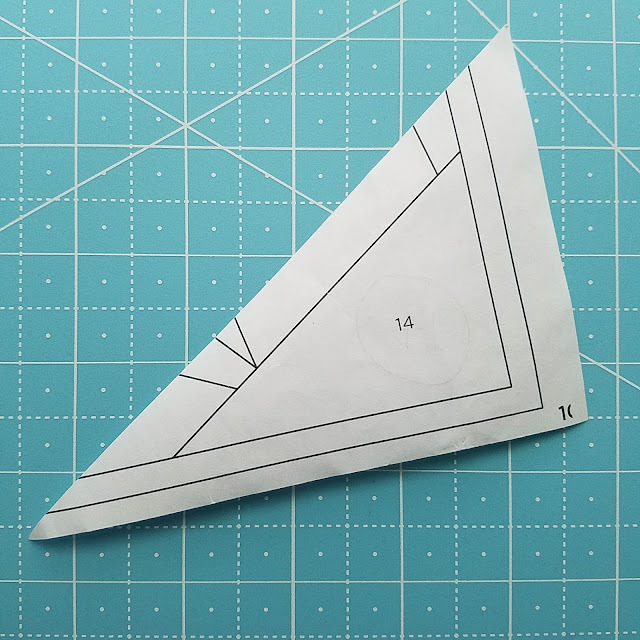 What is your favorite paper piecing tip or trick? Please share it in the comments below! Linking up with Tips and Tutorials Festival. You said " Cut the fabric with the back side of the template facing up and the right side of the fabric facing up." Thank you for this tip! I need to print this out in capital letters and tape it to the table when I do a paper pieced block. This was a great tutorial. I'm looking forward to seeing all your snails! This is an awesome tutorial Carrie. I always waste so much fabric when I paper piece.